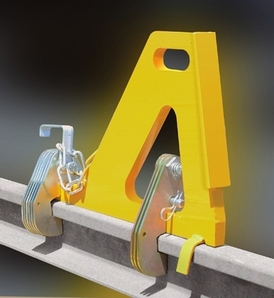 Cushion-Slide Crane Stops. Bumper Contact Type. Wedge stands 15" above top of rail. Centerline of crane bumper should not be more than 12" above top of rail. Cinch plates are made to fit a specific rail size and section. How to Order: 1. Describe bumper shape and dimensions, including height above rail. 2. Specify crane rail size/section.